Professional yet affordable man and van removals in WC1 area are just a phone call away! Get in touch with Man and Van King’s Cross for a choice of the most versatile and inexpensive removal and delivery solutions available locally right now. Whether you need to shift a couple of boxes up the road or relocate the entire contents of your home or office – you can count on us to organise and provide you with the right service at the right price. In order to save you time, effort and heaps of unwanted hassles we cover all stages of the service from planning and scheduling to unpacking and distribution of items upon delivery. With us people don’t have to worry about the safety and integrity of their goods as all necessary measures are taken to prevent damage or loss of valuables during handling and transportation. We work with dedicated removal teams made up of experienced porters and qualified drivers. We stick to flexible pricing schemes based on accurate service quotes. By doing this we are able to offer optimal value for money given the circumstances and meet individual budget needs of our customers. King’s Cross is one of London’s inner city districts which have seen much regeneration and redevelopment over the last couple of decades. Prior to extensive regeneration works in the mid-nineties, King’s Cross was a grimy red light district. However, the construction of St Pancras International Rail Station, with its famous Eurostar terminus put the area back on the map. The presence of one of London’s busiest train hubs – King’s Cross Station (adjacent to St Pancras) also gives the area more importance. We use a wide variety of shielding products in order to ensure the safety of the items that have been entrusted to us. The packing materials that we utilise are of the highest quality and have been personally tested by us. We also sell protective supplies at cost effective prices, and the best thing that is you won’t have to come and get them, as we will deliver them to you for free. Our King’s Cross, WC1, man and van services and packing options can be combined into a personalised bundle. King’s Cross, WC1, is an area that lies in the central parts of London. 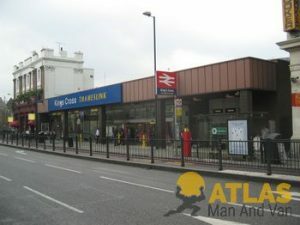 It is located on the boundary that separates the boroughs of Camden and Islington. The district has a population of about 14.000 people and is situated at approximately three miles from Charing Cross. The area lies in close proximity to several prominent landmarks, which is why tourists often choose it as their base.